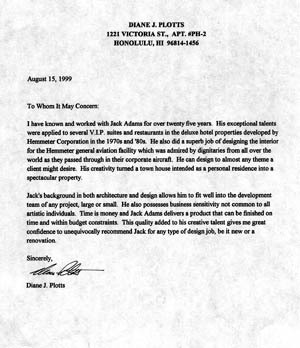 I have known and worked with jack Adams for over twenty five years. His exceptional talents were applied to several VIP suites and restaurants in the deluxe hotel properties developed by Hemmeter Corporation in the 1970s and '80s. He also did a superb job of designing the interior for the Hemmeter general aviation facility which was admired by dignitaries from all over the world as they passed through in their corporate aircraft. He can design to almost any theme a client might desire. His creativity turned a town house intended as a personal residence into a spectacular property. Jack's background in both architecture and design allows him to fit well into the development team of any project, large or small. He also possess business sensitivity not common to all artistic individuals. Time is money and Jack Adams delivers a product that can be finished on time and within budget constraints. This quality added to his creative talent gives me great confidence to unequivocally recommend Jack for any type of design job, be it new or a renovation.